REVAC 2016 – Southeast Asia’s International Refrigeration, Ventilation and Air-Conditioning Show, the largest gathering point for the Mechanical and Electrical Engineering Industry’s manufacturers, suppliers and vendors emerging, innovative and world-class technologies, products and services, offering unparalleled industry-targeted seminars and conferences to effectively introduce new offerings, increase brand awareness, promote products and connect with suppliers, customers and prospects. 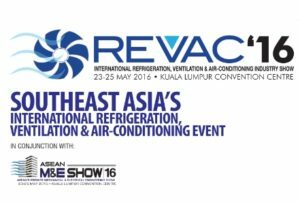 The long awaited Southeast’s Asia International Refrigeration, Ventilation & Air-Conditioning event, REVAC Show & Symposium 2016 has some of the HVACR BIGGEST BUSINESSES among the first committed to present in the show. Manufacturers, distributors have reserved their best location on the show floor, with many companies expecting to unveil all-new HVACR products and latest technology. Thousands of industry professionals come to REVAC Show & Symposium to find everything from the basics to the latest innovations in Refrigeration, Ventilation & Air-Conditioning and also expanding to Air Quality Control, Filtration and Insulation. REVAC Show & Symposium 2016 brings the HVACR community together under one roof, providing opportunities to build successful business relationships. We hope to see you there! In conjunction with ASEAN’s Premier Mechanical and Electrical Engineering Show, REVAC Show & Symposium 2016 will be held at Kuala Lumpur Convention Center from 23 – 25 May 2016. Endorsed by Malaysia External Trade Development Corporation (MATRADE) and supported by Construction Industry Development Board (CIDB), Institution of Engineers Malaysia (IEM) and Malaysian Air-Conditioning & Refrigeration Association (MACRA), the three-day event will see more than 350 exhibiting companies and expected 10,000 professionals trade visitors.